Is your Aadhaar card linked to your SBI account? If not, today I will tell you 5 methods, to link your Aadhar card with your bank account without visiting the bank. For your information, let us now that it is necessary for every bank account holder to link their Aadhaar card to their bank account. Recently aadhaar based money transfer facility also launched, for this you must have to link bank account with your aadhaar number. So let’s know about those 5 methods. Those who have net banking & mobile banking facility and those who have not both facility can link aadhaar with bank account easily. 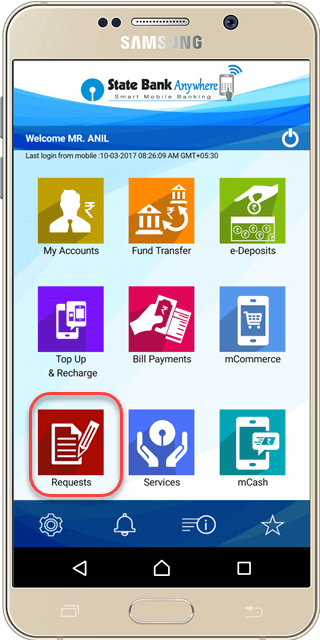 No need to login net banking or mobile banking. You can visit online sbi website and link aadhar directly. 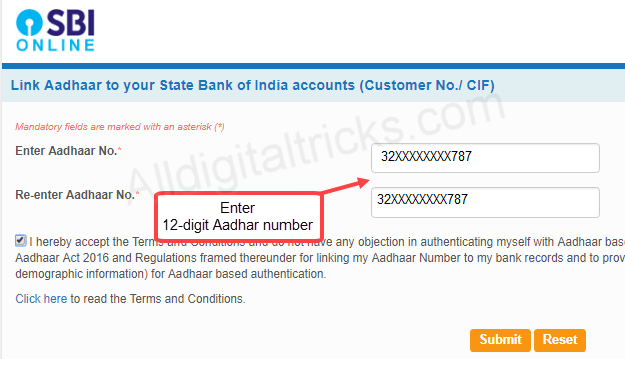 Here you have to click on Aadhaar Linking — Update Aadhaar with Bank Accounts (CIF). 2: Now type your account number in the next screen and submit it. 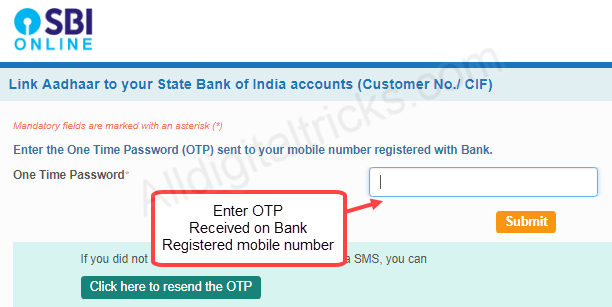 3: In next page, enter One Time Password (OTP) which received on your bank account registered mobile number. 4: In next screen, enter your 12-digit aadhaar number and submit it. 5: You will receive One Time Password (OTP) on your Aadhaar registered mobile number. Enter OTP and submit. Congratulations, your aadhaar is successfully linked with your sbi account. You can login to your Internet banking and link aadhaar with bank account easily. 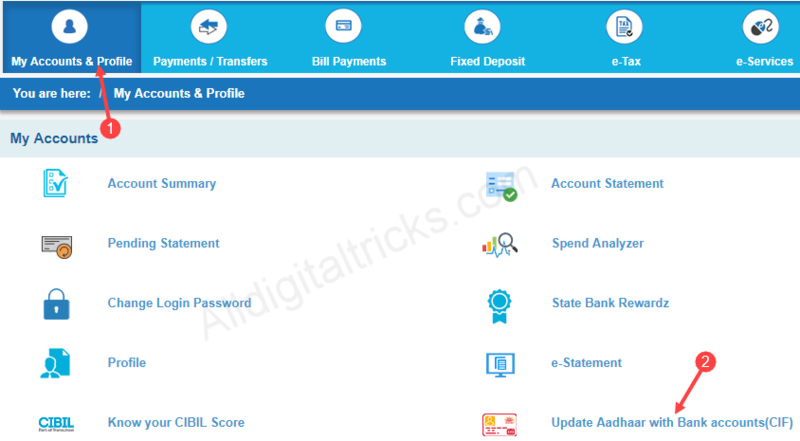 1: Login to SBI net banking account. 2: After login, click on My Accounts & Profile tab. You can see Update aadhaar with bank account (CIF), click on it. 3: In next page enter your 12-digit aadhaar number and submit. That’s it, you will receive reference number to track your application. For some reason if your aadhaar card not linked then you can raise a complaint using this reference number. State bank Anywhere is official SBI mobile banking Application. You can do all banking related works at here. Aadhaar seeding facility also available here. First of all login to your State bank anywhere, use your Internet banking user id and password to login. After logging in, tap on Requests tab. 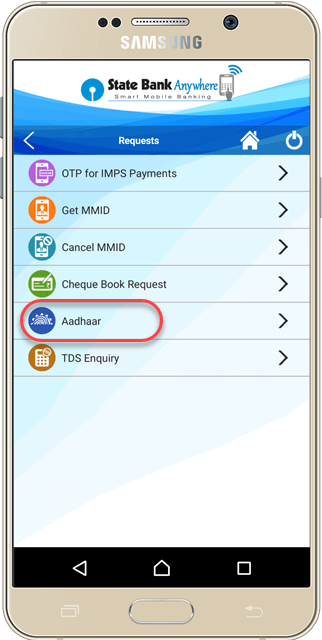 In Requests, you can see Aadhaar option, tap and open. Next screen tap on Aadhaar Seeding. Now enter your 12-digit aadhaar number and submit. 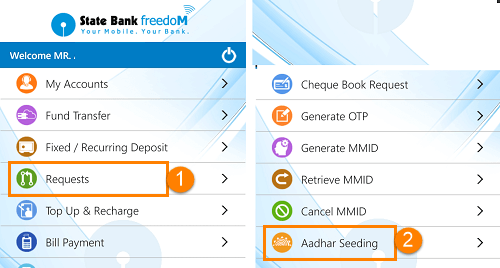 If you are using State Bank Freedom application then linking facility also available there. First login to your state bank freedom, enter user id and MPIN. After logging in, tap on Requests. 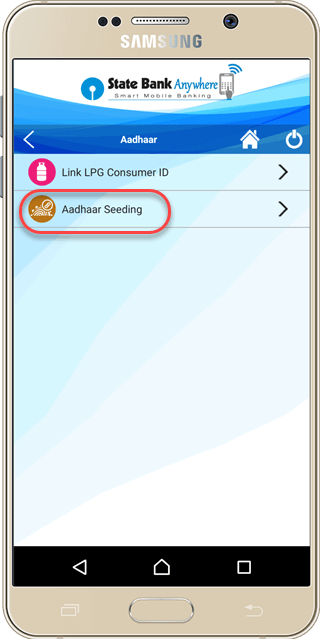 In Requests, tap on Aadhaar seeding option. In next screen enter your 12-digit Aadhaar number and submit it. If you are not using Internet banking or SBI Freedom then you can use SMS based facility to link your aadhaar card with SBI account. You can access any of sbi ATMs and link your Aadhaar with your Bank account. So, using these five methods you can link your Aadhaar card with your SBI account. You can also visit your branch with Aadhaar copy and submit it.